To describe the clinical features, risk factors for severe disease and effectiveness of oseltamivir in patients with 2009 pandemic influenza A (H1N1) virus infection. 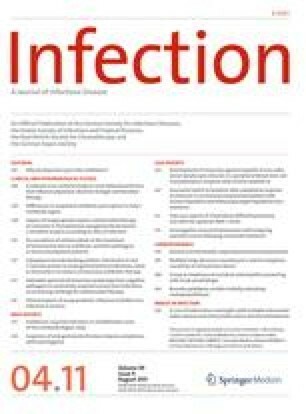 In a prospective, cross-sectional, multicentre study, data on 540 patients with confirmed 2009 H1N1 infection from seven Austrian hospitals were collected using a standardised online case-history form. The median age of the patients was 19.3 years (range 26 days–90.8 years); point-of-care testing yielded false-negative results in 60.2% of the 176 cases tested. The most common symptoms were fever, cough, fatigue and headache. Overall, 343 patients (63.5%) were hospitalised, 49 (9.1%) were admitted to an intensive care unit (ICU) and 14 (4.1%) died. Case fatality rates were highest (9.1%) in those aged 65 years or older. Factors significantly associated with a higher risk for ICU admission included age, neurological disease, adipositas, and both interstitial pathology and lobular pathology on chest X-ray. No association with pregnancy, malignancy or immunosuppressive therapy was detected. Antiviral treatment significantly reduced the duration of fever by 0.66 days and lowered the risk of ICU admission, but had no significant benefit on survival. During the 2009 H1N1 influenza pandemic, elderly or obese patients and those with neurological disease had an increased risk for severe H1N1 infection in Austria. Pregnancy was not associated with a higher risk for severe disease in the later phase of the 2009 H1N1 pandemic. Antiviral treatment provided a minimal effect on the symptoms of influenza but reduced the risk of admission to an ICU. On behalf of the Austrian Clinical Influenza Study Group. Collaborators: Milo Halabi, Walter Hasibeder, Holger Flick, Lukas Gansinger, Martina Voith, Gregor Chmelizek, Viola Maass, Wolfgang Sperl, Langenhorst Udo, Ingrid Pretsch, Richard Greil, Michael Grundbichler, Thomas Staudinger, Peter Schellongowski. W. Poeppl and M. Hell contributed equally. Chen M. World now at the start of 2009 influenza pandemic. World Health Organization (WHO). 2009. http://www.who.int/mediacentre/news/statements/2009/h1n1_pandemic_phase6_20090611/en/index.html. Austrian Federal Ministry of Health. Ein Jahr Neue Grippe—Die Maßnahmen des Gesundheitsministeriums. 2010. http://www.bmg.gv.at/home/Presse/Pressemeldungen/Ein_Jahr_Neue_Grippe_Die_Massnahmen_des_Gesundheitsministeriums. Redlberger-Fritz M, Popow-Kraupp T. Rückblick auf die erste Welle der Influenza A/H1N1v-Pandemie 2009/2010. Virusepidemiologische Information 05/10. 2010. http://www.virologie.meduniwien.ac.at/home/upload/vei/2010/0510s.pdf. Austrian Agency for Health and Food Safety (AGES). Zur Situation in Österreich. 2010. http://www.ages.at/ages/gesundheit/mensch/neue-grippe-ah1n1.